In Outre-Mer: A Pilgrimage Beyond the Sea, Henry Wadsworth Longfellow (1835) described his travels around Europe and what he learned about culture and society. He stated that “music is the universal language of mankind”. Many hold that the human condition is the common, universal experience of humans, such as people’s daily struggle to live a good life, their hopes for the future, their experiences of love and joy, loss and pain, their hopes for their children, their struggle to better their lives, as well as other aspects of human existence that are so fundamental, that they transcend national and cultural boundaries. Exploring the human condition as expressed in sacred world music is key to this study and its mission to reduce human hatred by creating greater understanding of those near and far. The story ‘Little Red Riding Hood’, is a European fairy tale about a young girl and a big bad wolf. It was first published by Charles Perraulta about a girl who goes on a walk through the forest in route to her grandmother’s house. On her way, she meets a wolf, who at first appears to be nice. She tells the wolf where she’s going, which later leads to the downfall of her grandmother. The overall theme of this story for some is, “do not trust strangers”. Slain U.S. Civil Rights leader Dr. Martin Luther King, Jr. held that “hatred” paralyzes, darkens, and confuses life (King, 1963). History’s not-so-distant past reveals that hatred played a role in the enslavement of Africans through the Caribbean and in North and South America and the horrific persecution of Jews in Germany. More recently hatred resulted in a massive genocide in Rwanda, Civil War that engulfed Uganda, ethnic strife in Sierra Leone, the cruelty of apartheid in South Africa, the widespread murder in the ethnic cleansing campaign in Bosnia, 911 in the U.S., the recent attacks in Paris, along with far too many others perpetuated by extremism, the heart-wrenching slaughter of innocent people in San Bernardino, California. These tragic events provide only a modest representation of a much broader global challenge linked to human hatred and the misunderstanding of others people who are different, fear of the stranger. Heralded works such as the primary texts of the Vedas in Hinduism, The Holy Koran of Islam, The Torah of Judaism, The Tripitaka employed in Buddhism, and The Holy Bible used by Christians, provide instruction on, as well as reasons why and how to treat others, meaning the stranger(s) or those who are different. In fact, some of these sacred works have been wrongfully employed to create fear, hatred of those who are different or believe differently, justify killing of innocent humans, war, and the marginalization of people. Close review of these sacred texts reveal their true purpose dedicated in part to the welcoming and kind treatment of the stranger. Each of these celebrated works illumines how humans have labored and failed, despite framed instruction and models, to overcome and cure this tragic condition. Exclusionary and polarizing nationalism, racism, gender discrimination, xenophobia, and religious intolerance continue to contribute to human hatred around the world, a human condition that has existed since the beginning of time, in which humans have historically struggled to find a binding cure for the disease hatred for those who are different. The ‘challenge’ continues today. A host of internationally recognized musicians have and continue to speak out through their music-making on the destructive nature of hatred. The vast list includes Ben Harper, Bono, Angélique Kidjo, Yasmin Levy, the late Nusrat Fateh Ali Khan, Peter Gabriel, Bono, Oliver Mtukudzi, Stevie Wonder, and the late Mercedes Sosa. Each has boldly championed and proclaimed their belief that music has the potential to cure human hatred because of its ability to communicate fundamental human emotions that depict the human condition in edifying and sometimes transformative ways. Many musicians with an international following have dedicated their artistic work to eradicating the world of hatred. One example on an extensive list includes Arto Tuncboyaciyan, a famous Armenian musician and composer who lives in the United States, and Yasar Kurt, who learned of his Armenian origins after the age of 40, produced an album in Armenia. Musically the recording speaks out ‘against hate, and animosity. This recording and a host of others, illumines the belief held my many musicians across the globe that music has the power to change our ill-directed perceptions about each other. The longstanding belief that music is “the universal language of humanity” is an idea steeped in widespread appeal among musicians today. This popular adage, embraced as truth, is not accepted thorough the academy and remains a somewhat elusive notion. Some researchers ask whether or not any given set of musically distinctive commonalities or attributes in music around the world actually exist. Empirical evidence linked to ethnomusicology regardless of analytical approaches, consistently demonstrates universally one thing: that nearly all music, is crafted by humans. There is another viable characteristic grounded in considerable debate posing, “can any aspect of musical expression be labeled universal?”. This question also challenges the aim of assigning “music”, let alone the fashionable term “world music”, a universally accepted definition. These factors coupled with limitations pointing to authorship and the range of how to evaluate the functionality of music within a given culture, makes it relatively clear why divergent perceptions within the academy will continue. This investigation acknowledges the disputation and chooses to use the term “world music” largely because it survives, continues to be broadly used across the music making industry and is a fundamental part of this presentation. Conversely a number of acknowledged inquiries on the global network of common musical phrases, pitches, rhythmic patterns, performance genres, thematic parallels, timbre, comparative vocalized approaches to the art of singing, melodies, socially-conscious content, inform how human rituals and behaviors intersect with group musical inclinations around the world. Unfortunately, and despite such a vast array of resources and research, there remains a sea of less-traveled approaches assigned to the exploration of potential ‘universalisms’ in music. Despite the backdrop of continued discourse on terms including “universalisms in music, “world music” and the like, there remains an ever increasing interest in various genres of music authored around the world. This interest from the review of this presenter dates back several decades with a surge in university courses, more international music festivals and concerts, vastly more produced recordings, the influence of tourism and the expansion of research, publications on lesser known music styles and access to music from around the world housed on the internet confirms that music created around the world is finding new and larger audiences. With this appeal comes an opportunity to better understand the human condition, and to change how humans view each other through the lens of music. This presentation strives to explore a different pathway by navigating human expression linked to sacred ideas that this presenter believes expose humanity’s deeply rooted rituals, daily practices and devout sentiments. Attitudes about self, others (how to treat the ‘stranger’), can be unearthed in this realm be they definitively theological, sacred or enshrined spiritual systems. This idea is linked to how people have over time used musical instruments and singing to express their most intimate sentiments that include but are not limited to social issues, the environment, politics, marriage, birth, cultural traditions, historical events, love, the harvest, hunger, marriage, children, war, deities and death. However, when these ideas are directed specifically toward or on behalf of the divine, they ‘transform’ the practitioner, the follower, the believer or the adherent who as history has shown, carried out acts for good and bad toward those who are ‘different’. This presenter holds that within this transformative space lies potentially new discoveries and the opportunity to re-evaluate old cultural and sacred paradigms that have the power to create greater understanding of the stranger. Various genres in sacred world music contain many central themes that are critically viable to each religion’s or spiritual systems expressions. Such themes, routinely found in narratives, verses or passages that describe a central idea that is housed within. Commonly, the subject matter a specific theme, is represented as a message or lesson the author(s) deems important and, want to convey. It is not uncommon for the practitioner to ‘study’ such stories over the course of their lifetime as a pathway to living a fulfilled life. This practice is sustained in nearly all sacred traditions. This analytical framework may or may not subscribe to some of today’s customary beliefs about sacred religious expressions, certain cultures or, what constitutes a sacred musical expression. Furthermore, rites, daily rituals, public and/or private ceremonies may or may not be acceptable to more broadly recognizable, universal or widespread traditional concepts about religion or what such institutions deem musically sacred. Those select music styles investigated, their usage patterns or genres of sacred music will be, (1) set apart from secular musical expressions, (2) must be originally crafted, (3) are or may be tribally, community or globally shared and (4), are reviewed as a means of increasing our understanding of the other, celebrating and illuminating the ‘good’ in humanity by a specific group of people. This researcher holds that a culture’s traditional roots music, indigenous or folk music, may have profoundly sacred elements within. This inquiry on sacred music may or may not represent a group’s adherence to more customary sacred or religious norms. In the context of this research, sacred music may or may not be crafted and/or thoroughly-composed for highly established liturgical presentations or public performances. This presenter recognizes the differences in how, why and where sacred tools (ex. voice, instrumentation, rhythmic patterns, timbre, percussion, etc.) are used and that they may or may not follow a widely accepted pattern of standard musical notation where for example, an elaborate vocal or instrumental compositional structure typically assigned to Eurocentric “classical” composition technique exists. Some of the sacred works considered will likely be rooted in an orally sustained structure unique to many cultures around the world. Conversely, some of the musical expressions examined that will be considered sacred, may in fact mirror or be linked in some manner to broadly influential religious settings where for example, a free standing edifice, group participation, reverence or devotion to a god(s) or deity(s), exists. This presentation represents an ongoing inquiry that inspects themes, vocalized and instrument playing patterns, words and their sacred or spiritual meanings, specific rhythmic patterns and, the use of select musical instruments like drums, used in sacred world music traditions. From my experience these factors specifically articulate crucial insights that reflect a given religion’s or spirit system’s beliefs or practices. From scholarship and my own experiential evidence, the methodology used for this experiment analyses the results with the purpose of learning if through sacred world music, increased understanding of those who are different may lead to the reduction of human hatred and greater empathy for the stranger. With so many opportunities it will be important to research well both musical adventures possible and the opportunities to explore Udaipur and Rajasthan. * Udaipur is in the northwest region of India called Rajasthan. *consider spending some days in Jaipur (7 hr overnight train ride) which Music in North India notes as a ‘major musical center’ of classical Indian music. Music in India notes Jaipur as a ‘major musical center’ but no additional information provided. Recommend information gathering from Ruckert and Mistry. Edgewood College is an independent liberal arts college in Madison, Wisconsin. As a Catholic college in the Dominican tradition, Edgewood is committed above all to the lifelong search for truth, pursued by men and women of all nationalities and backgrounds. All students, faculty, and staff — regardless of personal spiritual beliefs — are partners in the pursuit of a just and compassionate world. Sponsored by the Sinsinawa Dominicans, Edgewood College is a community of learners that affirms both its Catholic heritage and its respect for other religious traditions. The liberal arts are the foundation of all curricular offerings in the humanities, arts, sciences, and professional programs. Committed to excellence in teaching and learning, Edgewood seeks to develop intellect, spirit, imagination, and heart. Women and men who reflect the rich diversity of the world’s cultures and perspectives are welcome. Open, caring, thoughtful engagement with one another and an enduring commitment to service, all in an educational community that seeks truth, compassion, justice and partnership is fostered by connecting learning, beliefs, and actions. Wisconsin Public Radio is a civic and cultural resource that exists to enlighten and enrich the quality of life for its listeners. WPR consists of 34 radio stations programmed by seven regional studios and carrying programming on three content networks – the Ideas Network, the NPR News and Classical Network and the All Classical Network. WPR’s radio stations, studios, networks and online streams allow it to serve local, regional and statewide audiences with the highest quality programming available. As an ethnomusicologist, lyric baritone, conductor, lecturer, producer, clinician, and as of 2013, a “distinguished broadcaster” at Wisconsin Public Radio, Jonathan Overby wears many hats in an effort to explore, illumine, celebrate and edify diverse groups through world music. He believes strongly that music continues to have a powerful impact on humankind. Some known him as the host of Wisconsin Public Radio’s world music broadcast, “Higher Ground” in the United States. Others may be familiar with his annual Wisconsin Tribute and Ceremony honoring Dr. Martin Luther King, Jr., or his performances of the “Star Spangled Banner” for UW-Madison Men’s Basketball games. Jonathan’s endeavors include having served as a two-term Vice Chair of the Wisconsin Arts Board. In April, 2015, Dr. Overby was elevated to the status of Chief in the Wameru tribe of Arusha, Tanzania. Today, with undergraduate degrees in Administrative Arts, Voice and Choral Conducting, a Masters in Religious Studies and a doctorate in Administrative Leadership in Higher Education, Jonathan serves as an Edgewood College – Adjunct Professor and a Joseph Schmiedicke Post-Doctoral Fellow – the first Post-Doctoral Fellow in the history of the institution. His fellowship inquiry centers on Sacred World Music for the purpose of learning and sharing if increased understanding of various sacred world music traditions around the globe may lead to the reduction of human hatred toward those who are different. Through research, field work and extensive travels around the world, Jonathan believes his efforts have allowed him personally to learn from, better understand and celebrate varied styles of sacred world music. He adds that this has been a pathway to advancing his own celebration of the human condition worldwide. This understanding may have the potential for building bridges between diverse groups while more broadly celebrating cultural diversity, and the inclusion of marginalized groups who in some regions of the world are hated just because they are different. With the assistance of Edgewood College, support by Wisconsin Public Radio with private and public funding, Africasong.org site will serve as the fiscal agent for the Sacred World Music Research and Resource Project. Data gleaned from this inquiry will over the next five years be shared through a series of Edgewood College and Wisconsin Public Radio forums, lectures, sacred music concerts and the eventual publication of a audiobook, podcast and video documentary on Jonathan’s travels and research on sacred world music. To study varied sacred music traditions (formal and informal), customs and practices (individually and in the collectively) as a potential means to reducing human hatred around the globe. The goal of this research project centers in part on discovering if such an inquiry has the potential for increasing the understanding of marginalized groups or those who are different. To discover if and how increased understanding of sacred music as expressed in both liturgical settings and daily rituals of those who are different, might foster a more tolerant, empathetic and celebratory global community. Additionally, this effort aspires to learn if such understanding fosters greater cultural inclusion through the reduction of racism, gender discrimination, polarizing nationalism and religious bigotry. To review selected sacred music histories, their links to the earth, environment, deities, lyrics, texts, dance and/or physical movements, private and/or group rituals along with genres, stylistic underpinning of vocal and instrumental music in tribal and communal life will serve as the data to be reviewed. To uncover, analyse and chronicle through an established matrix any sacred universal music messages recognized among diverse groups (sacred messages for example about love, food, the harvest, relationships, social norms, etc.). For example, just being part of an established routine like removing shoes at an entryway, drinking of a cow’s blood, the formation and exchange of a handshake or even the practice of daily conversation with others could be considered sacred. Such activities are central to the growth and sustenance of various groups around the globe. Recognizing these and other viable activities as sacred may in fact add to our increased understanding of those who are different. 2015 Module 1 Funding; development of website; advanced research on the selected sacred music traditions to be examined. Fund Raising – Excursions. 2016 Module 2 Funding; field research; Feb. Cuba; Apr. New Orleans; Aug. Scotland; Oct. India; publication of data; presentations, lectures; photos and video; Edgewood College Forum Fall. (while in New Orleans, I will explore Louisiana Voodoo, aka New Orleans Voodoo which is represented by a set of spiritual practices that developed from the traditions within the African Diaspora. Voodoo in this region is a traditional sacred religious expression developed for the most part by enslaved West Africans. Like Santeria, Voodoo became syncretized with some Catholic religious practices forged in South Louisiana – this is due in part to the “Atlantic Slave Trade”. Watch here for details on my discoveries). 2017 Module 3 Funding; field research; Cuba; *Peru; *Australia; *Brazil; publication of data; presentations, lectures; photos and video; Edgewood College Forum Spring. 2018 Module 4 Funding; field research *China; *Russia; *Zanzibar; publication of data; presentations, lectures; photos and video; Edgewood College Forum Winter. 2019 Module 5 Funding; field research; *Tibet; *Morocco; *India; publication of data; presentations, production of documentary on findings; lectures; photos and video; Edgewood College Forum Spring. TRAVEL POST 2.21.16 – Just days ago I returned from an excursion to the island of Cuba. A group of travelers from the United States joined me for a ten day journey that explored the culture, food, sites and of course, the music of Cuba. This was my fifth trip to the island of Cuba and with it came new and refreshing experiences, insights and learning moments linked naturally to my interest and continued research on sacred world music. However, this trip offered me a much greater understanding of Santería – the pantheistic Afro-Cuban religious expression developed from the beliefs and traditional customs of the Yoruba people (largely Nigeria), married to key elements of the Catholic religion. I managed to secure an interview with a lecturer/practitioner of Santería – the pantheistic Afro-Cuban religious expression developed in part from the beliefs and customs of the Yoruba people (largely Nigeria) that includes some key elements of Catholicism. Santería, (Spanish word for “holiness”) respectfully known as Regla de Ochá or La Regla de Ifá developed within the Spanish Empire among enslaved West African descendants forced to ingest and openly practice Catholicism. Santería, expressed in private homes, is represented by a system of beliefs merging aspects of Yoruba mythology that includes both Roman Catholicism and indigenous African customs from Nigeria. Enslaved Africans brought to the New World various religious or societal practices, daily rituals, and customs, including a trance and divination (seeking knowledge of the future or things unseen through a super natural or spiritual system for communicating with ancestors and deities). This liturgical tradition includes animal sacrifice, voiced human expression – chants, sacred drumming and dance. 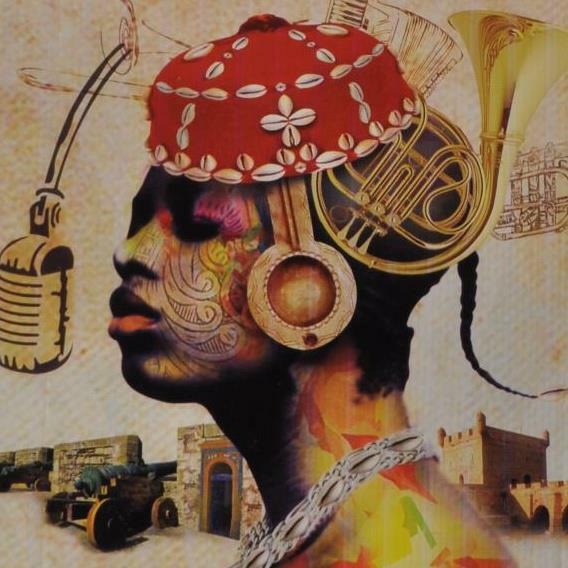 During centuries of the slave-trade and beyond, Santería was and remains a means of preserving the unique Yoruba cultural heritage within an extremely hostile and oppressive environment in Cuba under colonial rulers. Converts today are of diverse cultural backgrounds. Preserved traditions are grounded in African polytheistic religion expression, where, in Cuba, and quite surprisingly, the instruments, the language, the chants, the dances and their interpretations have been preserved. What unifies all forms of African music is the marriage of polyrhythmic percussion, voice (call-and-response) and dance in well-defined social settings, religious settings and the like. Babalú-Ayé is an Orisha spirit strongly associated with infectious disease and healing. The name Babalú-Ayé translates in English to “Father, lord of the Earth”, also points to the authority this orisha exercises on all things earthly, including the body, wealth, and physical possessions. In West Africa, Babalú-Ayé, definitively associated with epidemics, illness and disease is also the spirit that cures these ailments. Both feared and loved, Babalú-Ayé is sometimes referred to as the “Wrath of the supreme god” because he punishes people for their transgressions. People hold Babalú-Ayé in great respect and avoid calling his actual name, because they do not wish to invoke epidemics (ref. there is a curious, though not intended reflection of Judaism in not calling this spirit by name). Watch here for nuances that are reflected in Cuban ceremonies as well as musical samples designed to edify this spirit, followed by an introduction to other spiritual figures illumined in this religious tradition. One the next research steps to take will be to craft a matrix on what key elements should be posted regarding Santería beyond video, pictures and a narrative. I’m chewing on what universal messages should be noted as well. For example, recognizing a deity or multiple deities, rituals, definitive musical practices and instruments, and liturgical settings seem worthy points to note. I’m also interested in learning what styles of Cuban popular music sustains elements of Santería (mambo, rumba, son etc.). Please feel free to suggest others and/or a framework for how all of this might appear on the site. I do have one possible jumping-off-point that uses the song “Babalu'”, famously recorded by Dezi Arnaz and his Orchestra in 1946. You may recall or have heard of his performances of the work on the television show “I Love Lucy”. This adapted version of the original song is without question a Santería based religious work in which “Ricky Ricardo” sings to the “Father, lord of the earth” – Babalú-Ayé (the Orisha god name for St. Lazarus) “We do it for you Babalú, father of the earth Give me seventeen candles to put on your cross; Give me a cigar, give me some money, to give us good luck, Ha, ha I would like to ask may my brown sugar love me Oh, may I have money And may I not die, I would like to ask Babalú; charming black woman like you, may she have no other black man May she not leave Oh, my Babalú ayé. It’s hard to imagine that 1950s television audiences in the U.S. understood or would have tolerated the airing of the song if they did. In short form, Santería, known primarily among practitioners as either Regla de Ochá, Lucumí, or La Regla de Ifá, developed within the Spanish empire among West African descendants. The Spanish authorities forced Catholicism upon those enslaved as means of de-heathenizing their acquired human cargo. — Ernesto Pichardo, CLBA, Santería in Contemporary Cuba: The individual life and condition of the priestood, writes, “The colonial period from the standpoint of African slaves may be defined as a time of perseverance. Their world quickly changed. Tribal kings and their families, politicians, business and community leaders all were enslaved and taken to a foreign region of the world. Religious leaders, their relatives and their followers were now slaves. Colonial laws criminalized the religion/traditional sacred expressions of the those enslaved. In the end, they were forced to become baptized as Catholics and compelled to worship a god (they nor their ancestors had not known) who was surrounded by a pantheon of saints. The early concerns for survival by those enslaved during this period likely necessitated a need for individual and group survival under harsh and inhuman plantation conditions. A sense of hope help to sustain the internal essence of what today is called Santería, a misnomer (and former pejorative) for the indigenous religion of the Lukumi people of Nigeria. New converts to Santería (Havana, Cuba, 2007), are required to wear all white clothing each day for an entire year. However, they are first baptized Catholic and by in large, they adhere to and practice Catholicism routinely. In the heart of their homeland (in Africa), those enslaved and now existing in Cuba, had a complex political and social order. They were a sedentary hoe farming cultural group with specialized labor. Their religion, based on the worship of nature, was renamed and documented by their masters. Santería, a pejorative term that characterizes deviant Catholic forms of worshiping saints, has become a common name for the religion. Their is much to learn and digest from the historical practice of Regla de Ochá through a number of quality recordings and publications that offer detailed analysis and explanation f this important religious pratice that is today employed by more Spanish whites in Cuba than Afro Cubans. In April, 2015, Dr. Overby was elevated to the status of Chief in the Wameru tribe of Arusha in Tanzania (CV provided upon request). From his extensive independent research and travel an as the executive producer and host of Wisconsin Public Radio’s Higher Ground with Jonathan Overby, Dr. Overby explores and shares his experiences, insights and celebration of “world music with African roots and more”. On a Safari expedition to observe African animals in their natural habitat in the Serengeti National Park, Tanzania, April 2015. For the purpose of this research, the lens through which sacred music will be defined, employed and analyzed, will be in a culturally-inclusive context with the goal of creating empathy for those who are different and, increasing the understanding of the human condition. Additionally, studied sacred musical creations, may or may not for example, follow recognized patterns of standard musical notation where for example, an elaborate vocal or instrumental compositional structure, typically assigned to Eurocentric “classical” composition technique exists. Some of the sacred works considered will likely be rooted in an orally sustained compositional structure unique to many cultures around the world (ex. African Griot). Photo taken of Bi Kidude, legendary percussionist and Taarab singer, Stonetown, Zanzibar, 2012. Jonathan joins two street musicians in Marrakesh, Morocco at the city’s open air market (souk). Jonathan believes as many scholars do, that all music fits under the categorical umbrella labeled “world music”. A more common notion suggests that world music is the expression of a culture’s traditional roots music, indigenous music, or folk music. Some hold that world music is authored, created and originally played, interpreted, performed and composed by indigenous musicians within the communities uniquely related to the music and the region of origin where the music was first birthed. This in part, remains a troublesome idea, because it suggests to this researcher that if you are not originally from or deeply rooted in the culture of a particular group’s music, you cannot legitimately create or perform it. Exclusionary and polarizing nationalism, racism, gender discrimination, xenophobia, and religious intolerance continue to contribute to human hatred around the world. Since the beginning of time, humans have struggled to find a binding cure for what this researcher believes is a curable disease. Slain U.S. Civil Rights leader Dr. Martin Luther King, Jr. held that “hatred” paralyzes, darkens, and confuses life (King, 1963). History’s not-so-distant past reveals that hatred played a role in the persecution of Jews in Germany and the enslavement of Africans in the so-called “New World”. More recently, hatred resulted in a massive genocide in Rwanda, Civil War that engulfed Uganda, ethnic strife in Sierra Leone, the cruelty of apartheid in South Africa, widespread murder linked to ethnic cleansing in Bosnia, “911” in the U.S., the recent 2015 attacks in Paris and horrific slaughter of innocent people in San Bernardino, California. These sad and tragic events provide just a modest representation of a much broader global challenge associated with the disease, human hatred. Heralded works such as The Holy Koran and The Holy Bible for example, illumine how humans have labored and failed, despite framed instruction and models to emulate, how to resist, overcome and even cure this tragic condition. Moreover, both sacred texts have historically have been wrongfully employed to: create fear, hatred of those who are different or believe differently, justify killing, war, and the marginalization of people. Close review of these sacred texts reveal their true purpose is dedicated in part to love, peace, and the welcoming and kind treatment of the stranger. A number of internationally recognized musicians (and emerging artists) including Ben Harper, Bono, Angelique Kidjo, Yasmin Levy, the late Nusrat Fateh Ali Khan, Peter Gabriel, Bono, Oliver Mtukudzi, the late Mercedes Sosa have championed their belief that music has the potential to cure human hatred because of its ability to communicate fundamental human emotions and depict the human condition in edifying and sometimes transformative ways. This study is dedicated to those artists, musicologists, world music enthusiasts, fans, practitioners and participants in sacred world music, as well as the overwhelming collective of marginalized groups around the globe. Many believe in creating, promoting and sustaining a world where all sacred music traditions and not just some are remembered, edified, and celebrated through the potentially transformative understanding of the other’s (those who are different) music. It is also hoped that this research contributes to an expanded experiential, intellectual, phenomenological and potentially transformative conversation between scholars, sacred music creators, practitioners of and participants in formal, private and/or public settings where sacred music is rendered. Moreover, this study is intended to contribute value to discourse on sacred world music and the human condition as well as bridge the divide between scholarly analysis and interpretation of world music genres. The main sources to explore this subject are grounded in field research experiences assigned to ethnomusicology in both tribal and urban settings in specific countries targeted in Africa, South America, Eastern and Western Europe, Cuba, Asia, Australia as well as first Nation North American tribes where rich and diverse musical traditions exist. Will employ field recordings, video, photos, attendance to concerts and liturgical presentation, shared conversations with creator/artists and scholars. Funding for ground and air travel, production assistant, interpreter-guides, field recording equipment, access to past and current related research, access to collections of recorded, visual and electronic materials, flight, ground transportation, accommodations and food. This researcher has the skill and technical expertise to operate all audio recording and photo equipment.